Catherine Irene Murawski, 92, of Hannibal, MO passed away at 12:18 a.m. on January 1, 2018, at Sunset Home in Quincy, Ill.
Funeral services will be held 1:00 p.m. Friday, January 12, 2018, at the Smith Funeral Home & Chapel. Fr. Mike Quinn will officiate. Burial will be in Holy Family Catholic Cemetery. 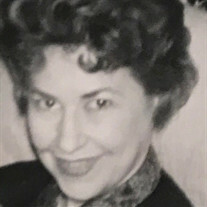 Ms. Murawski was born on July 25, 1925, in Hannibal, MO the daughter of Victor J. and Christine L. (Roszak) Murawski. Survivors include two brothers, Eugene Murawski of Quincy, IL and Willard Murawski of Carthage, MO; several nieces and nephews; and a very special friend, Robert Bastian of Hannibal, MO. In addition to her parents, Ms. Murawski was preceded in death by two brothers, Jerome Murawski and Donald Murawski..
Catherine worked for Southwestern Bell Telephone Company as a service representative in Hannibal. She was a member of Holy Family Catholic Church. Memorial contributions may be made to the donor's choice, in care of the Smith Funeral Home & Chapel.